Around 11 AM this morning, Crystal and I were out taking our routine walk through the local park for some exercise. The wind was calm. The temperature was brisk, but not chilly. The sun was bright and warm. Everything was wonderful about the walk. And then... we found two computers in a dumpster. There's a large waste bin in the local park we go to. It's not uncommon for people to come and drop their garbage off there, even though it's not legal to do so. While walking past the dumpster on our journey home, I noticed a black, metallic box peaking out one side of the bin. 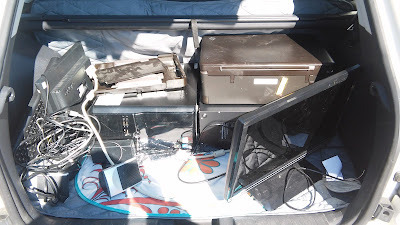 Upon inspection, we discovered two personal computers, two monitors, two printers and various others cables associated with them. Crystal ran home to fetch a vehicle while I stood guard and gathered our treasure. The computers were in good external condition with little wear and still looked very presentable. Getting them home, we immediately sorted out their various plugs and crossed our fingers. Would the computers turn on? Sure enough, they did! We didn't have a single bit of trouble getting either computer to work. Upon further investigation, we determined that they were created sometime around 2011. One is a Compaq and the other an eMachine. Each operates on a 64-bit Windows 7 platform and has a moderate amount of memory for their era. Both systems work great and could be put to good use! The two accompanying flat screen monitors also work and look very nice. In fact, I'm using one of them right now in a dual monitor set up. I've always wanted two computer monitors at my desk. Yes! Hilariously, one of the computers was password protected. But, we guessed the password on the first try. Why? Their password hint was 'or the highway'. Obviously, we guessed the password was 'myway'. Sure enough, it let us right in. Let this be a lesson to my readers... USE BETTER PASSWORDS! One of the computers had been wiped of almost all personal data and photos, but the other still had the original owner's documents. They deleted all of their files, pictures and music before tossing the computer out, but failed to empty the Recycle Bin folder to make the deletion permanent. Good thing I'm not an identity thief, or I could cause this nitwit a great deal of trouble. Folks, this is why I go dumpster diving. You can't believe all of the good stuff people just callously throw away. Much less, it is illegal to toss electronic goods in the trash. Even worse, throwing them away in a public park? What the hell is wrong with people? !